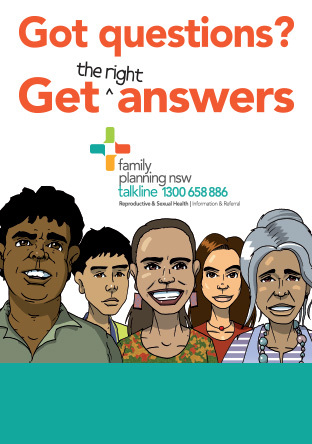 Family Planning NSW publishes fact sheets in a wide range of community languages. These provide essential information about reproductive and sexual health, contraception, menstruation and STIs. Most Family Planning NSW fact sheets include english language translations. Cervical Screening Test - Arabic, Assyrian, Chinese, Dari, Farsi, Hindi, Karen, Spanish, Swahili, Tamil, Vietnamese . English language versions of the Women and HIV fact sheets are also available. Family Planning NSW is dedicated to improving the reproductive and sexual health of culturally and linguistically diverse (CALD) communities through culturally appropriate clinical services, health promotion, education and training, research and advocacy. We work with multicultural and refugee health services to ensure women and men of all ages, from non-English speaking backgrounds have equal access to our reproductive and sexual health information and services. We offer free translator services for clinic consultations and have translated a range of factsheets into languages other than English. In any one day our clinicians listen to, care for, treat and support people from diverse backgrounds who are facing complex and difficult issues relating to their reproductive and sexual health. When someone comes to see us, they come to talk about matters that are profoundly personal. We are privileged to listen without judgement to each and every story from each and every person and to assist in finding solutions that are right for the individual in their own circumstances. We stock a number of informative resources for people from CALD backgrounds, including, CD’s, DVD’s, books, and flipcharts. Take a look in our Shop. Health related Factsheets in community languages are also available on the NSW Government Health website at www.mhcs.health.nsw.gov.au.